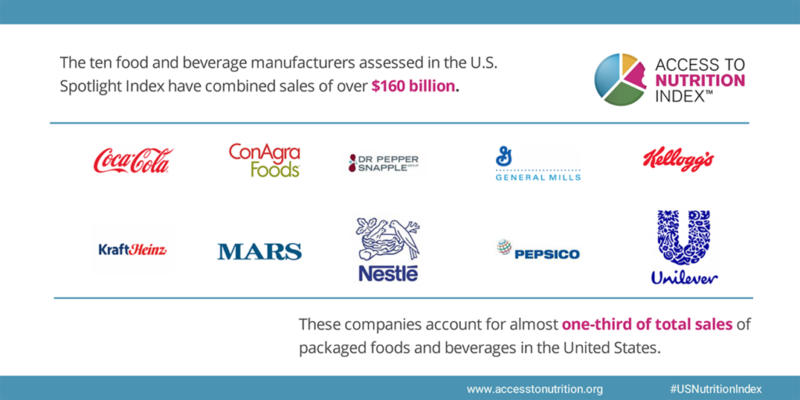 In November 2018, the Access to Nutrition Foundation (ATNF) released the first-ever U.S. Access to Nutrition Index, an independent evidence-based evaluation of what the 10 largest U.S. food and beverage companies are doing to tackle the high levels of obesity and diet-related diseases in the United States and increase consumers’ access to healthy, affordable products. This includes companies’ efforts to improve the nutritional quality of their products; how they price and distribute their healthy products; as well as their marketing and product labeling. Below is a conversation about the U.S. Index and the important role food and beverage companies can play in helping kids and families eat healthier. Jamie Bussel is a Senior Program Officer at RWJF. She focuses on supporting programs and policies that increase access to healthy food and opportunities for physical activity. Jamie plays an integral role in shaping the Foundation’s approach to helping all kids grow up at a healthy weight. Victoria Brown is also a Senior Program Officer at RWJF. She helps lead the Foundation’s efforts to engage businesses around health. Through collaboration and partnerships, Brown works with the business community to create and/or improve their practices with the goal of helping children lead longer, healthier lives. JB: As a parent and someone working at the intersection of nutrition and public health for more than a decade, I know the policies and practices of food and beverage companies have a powerful influence on what we purchase and consume. What does the U.S. Access to Nutrition Index reveal about what these companies are doing to harness the large role their products play in our diets? VB: I’ve been working with food and beverage companies for more than a decade to find ways they can change their products and practices to help kids and adults eat healthier while still being good for business. I have vivid memories of sitting across from leaders of Fortune 500 food, beverage, and fast food companies, such as Coca-Cola, PepsiCo and McDonald’s, and encouraging them to prioritize health in their strategic decision-making on product development, distribution and marketing. I know firsthand the distance many of them have traveled from some of our initial conversations in 2007 when the epidemic of childhood obesity was starting to gain attention. The companies included in the U.S. Access to Nutrition Index are part of that positive change. 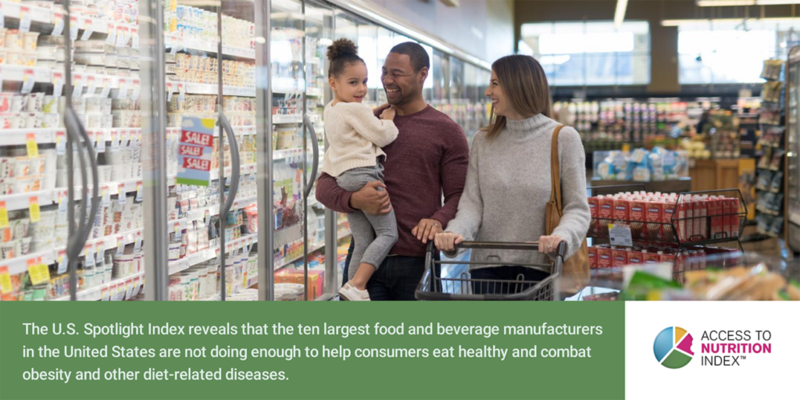 Many have taken steps to help consumers eat healthier by reformulating products to improve nutrition through voluntary initiatives such as the Healthy Weight Commitment Foundation and the Balance Calories Initiative. They have also tried to market their products more responsibly through commitments with the Children’s Food and Beverage Advertising Initiative. We commend these voluntary efforts, but ATNF found that they are not enough. Companies still fall short on their efforts to help U.S. consumers eat healthy and combat the country’s high rates of obesity and diet-related diseases. Less than one-third of the companies’ products are healthy according to the independent Health Star Rating nutrition criteria. There is still too little effort underwayto improve the affordability and accessibility of healthy products. Marketing practices are not as comprehensive as they are in other countries; for example many manufacturers are not yet using the easy-to-read labels on the front of their packaging, even though they voluntarily do so in other countries. So, while they have made improvements, there is more work to be done. JB: Who do you think will benefit from the findings of the U.S. Index and how will they be used? VB: I cannot stress enough how crucial a tool like the U.S. Access to Nutrition Index is for those of us working with the food and beverage industry. If you are asking a company to change their current practices, it is only fair (for both the advocate and company) that you have a full understanding of their current business practices. When we’re looking for ways to work with companies to address the obesity epidemic, it’s so important to have an independent, accurate evaluation of what food and beverage companies are actually doing to develop, price, market and distribute healthier products. It’s also a great tool for advocates and policymakers who might not be working one-on-one with the companies, but are pushing for change in other ways. And, consumers, especially those who care about supporting companies that align with their values, will find the Index useful in terms of decision-making about which brands and products to purchase. The Index is also enormously helpful for companies because it offers a holistic breakdown of their nutrition and health policies and practices, so they can easily see where they are doing well and where they can improve. Lastly, ATNF collaborates with the investment community, which is a really unique part of their approach. Responsible investors and shareholders understand the risk and value proposition for why prioritizing the health of a product and consumer health is so critical to the bottom line. ATNF works with more than 50 international investment organizations to share the results of their reports, so they can use their engagement with companies and investment decision-making to push for change. JB: As you noted, we want to work with food and beverage companies to help them improve how they create, distribute and market their products so that kids and families have access to affordable, healthy foods and beverages. And, you mentioned that the companies are doing some of this work. Did the U.S. Access to Nutrition Index feature some of their improvement efforts? VB: Yes, while all of the companies, even those that ranked in the top spots, have a lot more work to get done if they truly want to help consumers eat healthier, there were some bright spots that are important to highlight. Good work should be acknowledged, and acknowledging it can encourage other companies to follow. 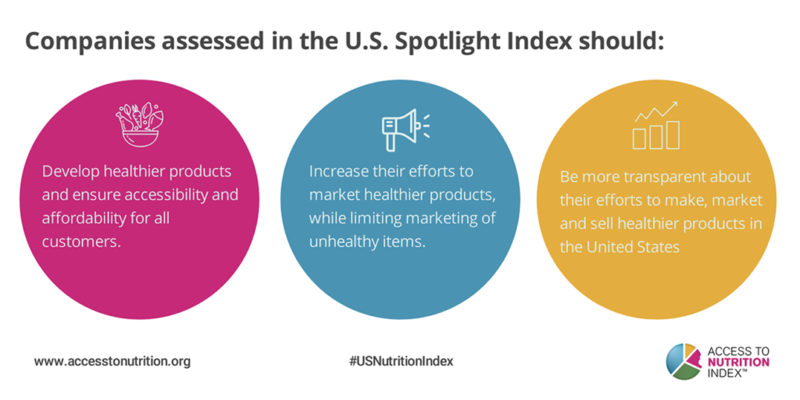 The U.S. Index did highlight some great examples of companies leading the way on transparency, marketing commitments, and product reformulation. Nestle has a “Creating Shared Value” report, which outlines the company’s nutrition strategy and how it is baked into overall business strategy. That connection is so important because if nutrition efforts are kept separate from the company’s broader plans and goals, then they are typically less of a priority for key company decision-makers and, ultimately, less successful in the long-run. Con Agra and Unilever also are open and candid about the progress they’re making to meet nutrition reformulation targets, which is great for accountability. Mars conducts extensive audits on its marketing policies to make sure they are complying with their overall marketing commitments and specific commitments they’ve made on marketing to children, which is really crucial given all the research that shows the influence advertising has on kids’ choices and eating habits. These are commendable voluntary efforts that we hope inspire other companies to follow suit. JB: We know there is no one simple solution for addressing the high rates of obesity in this country and everyone must contribute in some way. What do you recommend food and beverage companies do? VB: As you know, one of the reasons for the high obesity rate among both adults and children in the United States is because most of us are eating too much unhealthy food and not enough fruits, vegetables, whole grains and other healthy items. It is essential that kids and families, no matter where they shop for food, have access to affordable, healthy products. The food industry needs to be part of the solution. So, first and foremost, we encourage companies to continue to improve the nutritional quality of their products. And, they should work on affordability perhaps by lowering the price difference between healthy and unhealthy products. And, as I mentioned earlier, many of these same companies make efforts to improve the affordability, accessibility and labelling of their products in other countries. We call on them to bring these good practices to the U.S., so that regardless of where we live or how much money we have, we can purchase the kinds of foods and beverages that support our health and well-being. Originally posted January 24, 2019.